Democratic candidate Deborah Gonzalez, running in the 117th District special election, said the state should expand Medicaid. Steven Strickland, a Republican candidate in the 119th, said the state has done a good job of keeping the number of Medicaid participants per capita “at one of the lowest levels nationwide." Jonathan Wallace, running as a Democrat in the 119th, said expanding Medicaid would make the state’s population healthier and more competitive in the future. Tom Lord, the third Republican candidate in the 119th, said he would oppose the state making major policy changes in the medical area until the federal government acts. The forum began a little after 6 p.m.–after a delay because of microphone problems--at the auditorium of the Athens Library on Baxter Street. 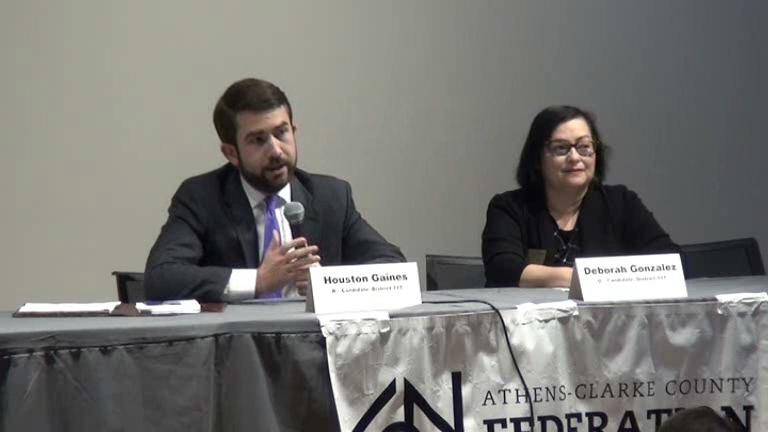 Candidates Gaines and Gonzalez came to the table on the stage first and answered the five questions posed by moderator Moore. Moore said the questions had been written by the members of the Federation and that no questions from the audience would be allowed. The whole session lasted just more than 30 minutes. At 7 p.m., the candidates for the 119th climbed onto the stage and took places at the table. Lord sent word that he would not be able to attend for health reasons. Suki Janssen, Federation of Neighborhoods president, took Lord’s place at the table and read Lord’s written responses to the questions. The questions had been provided to each of the candidates last week. The second session lasted just less than an hour. The first question asked the candidates to rank the state priorities “by importance and/or urgency” and provided a list with seven different options. The candidates had some difficulty sorting out the complicated list. The second question was on “firearm regulations” and “campus carry” and gave the candidates some options on how to answer. The third question was on “procedures for mapping elections districts” and provided overlapping response options. The fourth question was quite long and asked about local control. It gave as an example community control over banning plastic bags. The fifth question was the simple one on health care. Campus carry came up at a September meeting of the Oconee County Republican Party, attended by the four Republicans. It also came up at a forum for all six candidates in Oconee County earlier this month. “I’m a strong supporter of the Second Amendment and will continue to be in my term in office,” Gaines said. “For strong supporters of the second amendment, there’s too many exemptions in the law. It’s hard to actually carry a gun on campus,” Gaines said. “The goal of a university and college is to teach students, and things that affect negatively that goal of teaching students should not be imposed upon that institution,” Gonzalez said. “That legislation should not even be on our campus,” she said. Wallace said he wants to repeal the existing law. “I have a daughter at UGA, and I like the fact that she can defend herself should she decide to,” Lord wrote. “With regard to campus carry, I support the bill,” Strickland said. “I support the Second Amendment. Strickland said the campus carry bill as passed does have problems and should be reconsidered. Questioners at earlier forums also have asked about health care, but the question read by Moore was simple and straightforward. “If the states are not going to step up, let’s us the community step up to help each other,” Gonzalez said. “Medicaid expansion would add nearly 100,000 Georgians to the Medicaid rolls here in Georgia, and that would exponentially increase the responsibility of the state once the federal funding is gone, which it will be gone,” Gaines said. Membership includes neighborhood association, other communication organizations, and individuals. The meeting Monday night was open to the public, and just at 90 people were in attendance as the first session got underway. Others trickled in during the session, and some left. The second session was attended by 70 individuals. The 117th is made up of Barrow, Clarke, Jackson and Oconee counties, with Clarke County dominant in terms of voter registration, and the 119th is split equally between Clarke and Oconee counties. At the bottom of this post I have embedded two videos. The first video is for the 117th and the second is for the 119th. I eliminated some of the dead time resulting from the microphone problem at the beginning of the session on the 117th, but otherwise the videos are complete. Candidates were given one minute at the beginning of the session to introduce themselves and one minute at the end to summarize. Candidates were given three minutes to respond to each of the five questions. I have annotated the video based on the five questions posed. Question 1: How would you rank state government priorities by importance and/or urgency: transportation, economic development, public education, crime/law enforcement, public health, welfare, licensing, regulation of businesses, others (specify); and (to the extent time permits) explain why. In the 117 Session, this question is at 7:10 in the video. In the 119 Session, the question is at 7:35 in the video. Question 2: What are your views on dealing with firearm regulations and related issues, including campus carry: tighten, loosen, or keep the same? How and why? This question starts at 12:40 in the video from the 117th. The question begins at 17:58 in the video for the 119th. Question 3: Are existing procedures for mapping election districts in need of change/improvement, or should they be changed? Why and how? This question is asked at 16:08 in the 117 session. This question is at 26:48 in the 119 session. Question 4: Traditionally, Georgia legislators seem to be in favor of local control on many issues yet we see legislation introduced each year that would take that local control away. For example, twice in the past four years legislation to prohibit local governments from banning plastic bags, water bottles, disposable items has been introduced and nearly passed. What are your thoughts on local vs state control? This question starts at 18:46 in the 117 session. This question starts at 58:28 in the 119 session. Question 5: What can and should the State of Georgia do to assure that as many as possible of its citizens have affordable access to the health care they need? This question is at 23:24 in the 117 session. This question is at 43:59 in the 119 session. 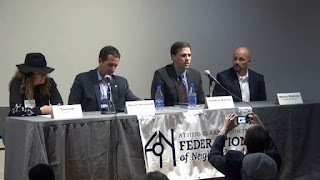 OCO: Candidate Forum 10 23 17 District 117 from Lee Becker on Vimeo. 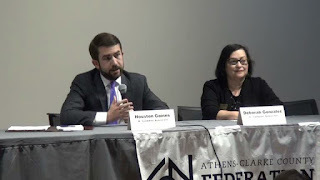 OCO: Candidate Forum 10 23 17 District 119 from Lee Becker on Vimeo. You seem to have left out the fact that Gonzalez proposed an additional 1% SPOLST on everyone to help pay for health care. The usual answer to any problem, more taxes. Strickland’s responses appear more informed and with direction for governing. I am going back to review past forums. Vote count will be interesting. As I wrote in the story, the candidates were given three minutes to answer questions. I shortened the answers, as, I hope, is obvious. That shortening leaves out things. I have included the full video, annotated to help readers find the questions and full answers given. "Since we’re talking about T-SPLOST, which also is on the ballot, I’d also like to see something like an H-SPLOST. Let’s do something for healthcare for those who don’t have it. If the states are not going to step up, let’s us, the community, step up to help each other." Again, I ask those who wish to make arguments about the candidates to identify themselves. It is fairer to the candidates and to the other readers.